This canvas is framed in a dark wood frame with linen liner. 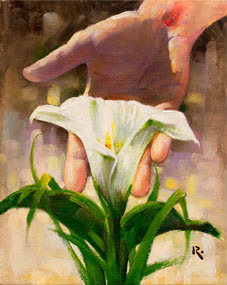 "Jesus put the whole of life in perspective when He told us to observe the lilies. They are so beautiful, and yet they don't work or fret for their existence. Even though they are lower than us on the scale of importance in God's eyes, God cares for their every need. How much more then does the Creator care for us, His most prized creation? Sometimes we forget that God is our provision, just as He is for the lily. "Consider the Lilies strikingly shows Jesus' hand reaching down to the lily — showing all that if He cares for them, how much more will He care for each of us." Consider the Lilies copyright© by Ron DiCianni.